Cappuccino, Latte, Mocha, Flat White: What's The Difference? The choice of coffee is no longer one of whether you’ll take it with sugar, milk or black. Nowadays every local and chain café offers a wide range of coffees of which most are espresso based. While many people probably know that an espresso is a small shot of black coffee and a cappuccino has milk, the difference between a cappuccino, flat white, latte or mocha might be harder to pin down. Whether you want to be savvier at the coffee shop or replicate the drink you like the most at home, here’s your guide to untangling the differences. So, how can we make differentiate between cappuccino vs latte vs mocha vs flat white? 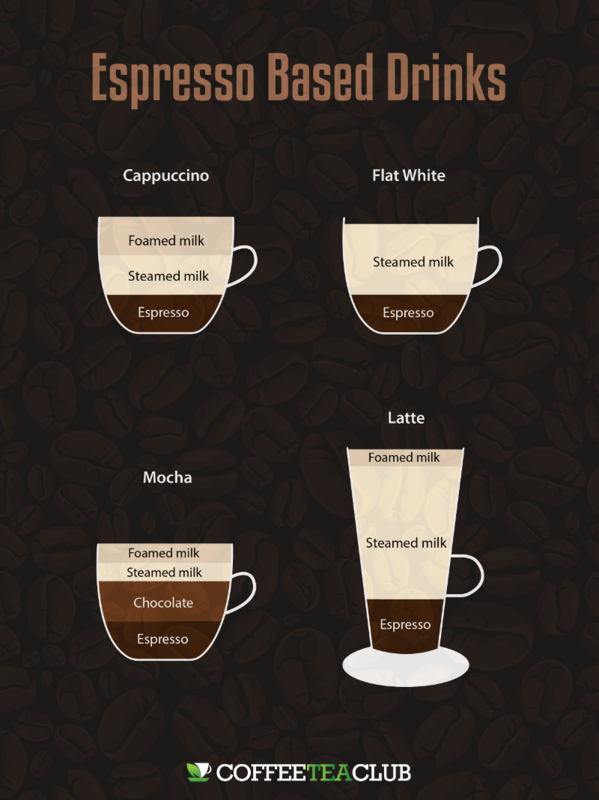 First of all, it’s important to know that all these drinks begin with a strong shot of espresso and then use varying amounts of frothed or steamed milk. A cappuccino, for example, will use equal parts espresso, frothed and steamed milk, whereas a latte will be largely steamed milk with a small amount of frothed milk on top. As mentioned above, a cappuccino often contains equal parts of espresso, frothed milk and steamed milk. While this is increasingly changing, the size of a cappuccino should normally be smaller than that of a latte and a cappuccino cup is usually between 150 and 180 ml, so quite a bit less than your cup measure. The size of the cup is important to get the right flavour – balancing a single shot of espresso with the right amount of milk. You can also try dry (or dry bone) cappuccino that still contains all the three ingredients but with much less milk. Many barristas will start by pouring the 1/3 of steamed milk in the bottom of the cup. They will then pour the espresso carefully inside and finally spoon the frothed milk on top. This creates the right layering of flavour and textures. However, if you are making it at home on an espresso machine that needs to heat up to be able to foam the milk it is probably best to begin with the coffee and then add the steamed milk and finally spoon the frothed milk on top. Alternatively for a more velvety texture you can begin with spooning in the frothed milk and then carefully pour the steamed milk on top. This is supposed to create the type of layered microfoam (small bubbles of air incorporated into the milk) that makes a cappuccino great. The big brother of the cappuccino – the latte – is often made with a double shot of espresso making up 1/3 of the cup, along with 2/3s steamed milk and then a smaller layer of frothed milk on top. A full 240 ml cup is usually used for a latte. In its country of origin – Italy – however, a “caffè latte” is only a coffee with milk and the short form “latte” is simply a glass of milk. The preparation you see outside of Italy named a latte would rather be called a “latte macchiato” in its homeland. Similar to the cappuccino you will need to layer the espresso and the steamed milk. However, because we only want a small layer of frothed milk on top you pour fairly liquid steamed milk onto the espresso while holding a spoon to stop any of the frothed milk from mixing. The mocha, mocaccino or caffè mocha is in its essence a strong hot chocolate with a shot of espresso and steamed milk added to it. Often equal parts of espresso and hot chocolate is used along with a smaller amount of steamed milk amounting to approximately a fifth of the espresso and chocolate. Additionally a layer of frothed milk – similar to a latte can be added on top. Variations of mocha use either cocoa powder mixed into the milk or chocolate syrup added on top of the steamed milk. Replacing the final layer of frothed milk with cream can create a more luxurious version. A double shot of espresso (60 ml) would commonly be added to equal (or greater) amounts of chocolate along with about 20-40 ml of steamed milk to make the same sized cup as used for a cappuccino. Prepare the hot chocolate and the espresso. Layer the chocolate with the espresso and then finally carefully pour in the steamed milk. Finish off with spooning either cream or frothed milk on top. A sprinkling of cocoa powder on top serves to intensify the chocolate taste. A newcomer to UK and Europe, this is a coffee variant originating from New Zealand and Australia. A flat white is usually smaller than a latte and uses a microfoam mixture of both froth and liquid steamed milk. This creates an even and smoothed mixing of the milk without the types of layers seen in the latte or cappuccino. There should be a velvety foam mixed well with the espresso which creates the difference from a latte where a latte is more like coffee with milk. Prepare the espresso and then freely pour the steamed milk into the cup. The ratios should be approximately 1/3 espresso and 2/3s milk. The steamed milk should form a microfoam but not have a stiff foam as that used on top of a latte or cappuccino. Frothed vs steamed milk: what’s the difference and how do you make them? What you might have realised from reading this far is that the main difference of all these espresso based drinks lies in the milk. Ensuring that the milk has the right texture and foaminess is important for both how the drink feels in the mouth but also for how it mixes with the coffee and creates the unique flavour of the drink. To create microfoamed, frothed or steamed milk you will need use the steaming function of your espresso machine or a milk frother. The aim of either of these tools is to introduce air into the milk. However, the steaming wand has the additional function of heating up your milk by using steam. If you are using a milk frother you need to heat the milk up in a pot while frothing it. The ideal temperature of milk used for espresso drinks is around 65 degrees C so it is recommended to carefully heat it if using a stove – once it reaches 70 degrees C the milk will change flavour and ruin your drink. The difference between different forms of frothed or steamed milk lies in the amount of air that is introduced into the milk. For frothed milk you should introduce a lot of air, doubling it in volume whereas steamed milk should increase by about one third. In both cases you place the steaming wand or the frother just below the surface to create a vortex, but in the case of frothed milk you gradually lower the wand towards the bottom in order to build up a layer of foam on the top. To create a microfoam texture you want to first froth the top layer of milk and then put the wand towards the bottom to create steamed milk. You finally tap the milk against the counter or with your hand and let it sit so that the bubbles fully settle. Before pouring (into your flat white) you ensure to carefully turn the container of milk a couple of times so that you get a smooth mixing of foam and liquid when pouring into your espresso. This is very good to know. The first time I ever went to Starbucks I must have looked like a deer in headlights with all these options. Now I have a better understanding of the types of drinks. I have never heard of Flat White before. That is interesting and seeing those graphics explains what is happening very easily to me. thank you for posting that! Wow, I never really thought about all of the details like this. Thank you for clearing things up for me. I am trying to figure out how to make the skinny version of the mocha. I know when i order at Starbucks i ask for half whipping cream and steamed water but i dont know the amounts of each one to put in. Any idea or tips?